Item # 287745 Stash Points: 297 (?) This is the number of points you get in The Zumiez Stash for purchasing this item. Stash points are redeemable for exclusive rewards only available to Zumiez Stash members. To redeem your points check out the rewards catalog on thestash.zumiez.com. Socks get lost so get a few pairs of these Boys Grey & Black Crew Socks in youth-sizing for kids' from Zine. 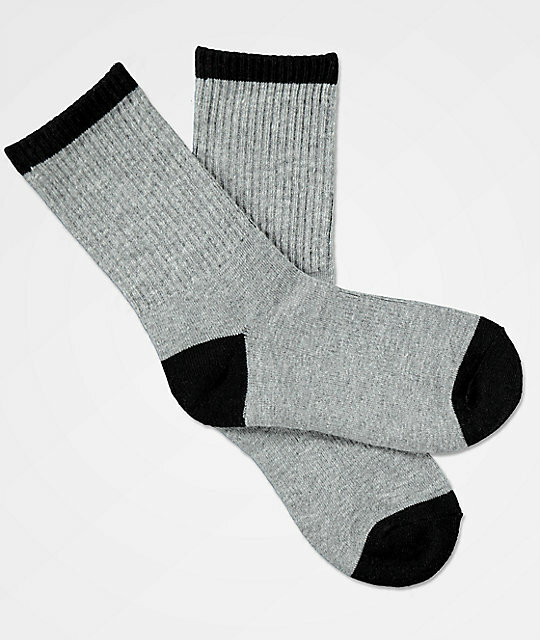 A classic pair of two-toned grey and black crew socks offers a cushioned footbed with stretch throughout for comfort. Boys Grey Crew Socks from Zine. Fits youth shoe size 2-5.5 (US Kids'). Black toe box, heel cup & upper trim. Athletic ribbed upper for secure fit. 95% polyester, 4% rubber, 1% spandex.